We know that neanderthals and homo sapiens interbred, and that some people carry the genetic markers of that interbreeding. 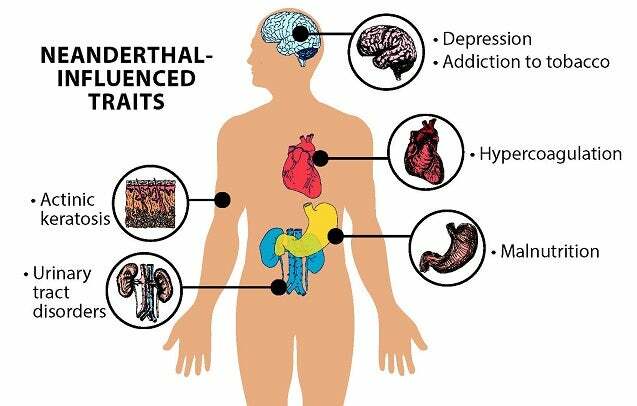 A new study looks at what it means to have neanderthal DNA mixed into the human genome — and researchers have found everything from a propensity for nicotine addiction to multiple genes affecting depression. The study, published in Science, concludes that over 100,000 genes are likely to have been inherited from our long-dead neanderthal ancestors. To get a picture of which genes came from the distant past, researchers took a look at a map of the neanderthal haplotype (the many variations of genes that a species carries) and compared it to the genes carried by 28,000 Europeans who’d had their genetic profile linked to their medical records. By comparing the genetic profiles of neanderthals and modern humans, the researchers came up with a list of 135,000 genetic variations likely to have been passed to humans by neanderthals. They then compared the genes inherited by the neanderthals to the medical records of the humans carrying those genes.